The Friends of the Hong Kierkegaard Library is an organization dedicated to furthering the educational purposes of the Library. Assisting visiting scholars with stipends for travel and other expenses. By the end of 2010 The Friends had financially assisted scores of scholars. Sponsoring academic conferences on Kierkegaard and other Library events on the St. Olaf campus. Hosting semi-annual forums in May (the month of Søren Kierkegaard’s birth) and November (the month of his death). The Friends members gather informally on the campus to enjoy a meal together and afterwards to discuss selected Kierkegaard passages or hear a keynote speaker. Funding acquisitions of rare and sought-after volumes when such books become available and the Library sees fit to purchase those acquisitions. 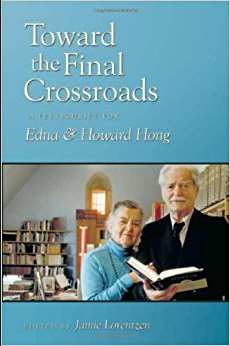 Called for papers and funded the publication of Toward the Final Crossroads: A Festschrift for Edna & Howard Hong, edited by Friends Chairman Jamie Lorentzen (hardcover, Mercer University Press, 2009, ISBN: 9780881461596). Initiated and funded a written history of the Library authored by Dr. Jack Schwandt, Professor Emeritus of Political Science entitled, The Hong Kierkegaard Library A Crown Jewel of St. Olaf College. The Friends invite you to join us! Invitations to Friends meetings with complimentary luncheons at St. Olaf College. Notices of special Friends-sponsored events. The satisfaction of participating in the important work of supporting this fine Library along with the many other Friends in the international Kierkegaard community. The Friends of the Hong Kierkegaard Library is a charitable non-profit organization under the fiscal agency of St. Olaf College. Annual Friends membership is $25 ($10 for students); tax deductible contributions to Friends’ projects are welcome in any amount. You will receive a receipt for tax/charitable giving purposes. For membership information, write to the Chairman, Jamie Lorentzen.